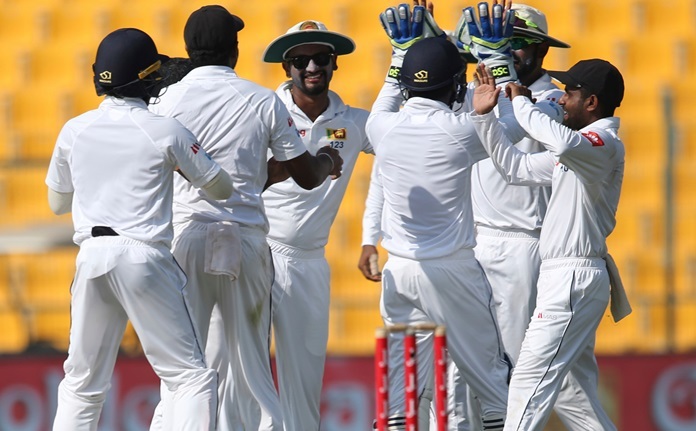 Abu Dhabi, UAE (AP) — Pakistan trail Sri Lanka by 153 runs in an evenly balanced first test after reaching stumps on the third day at 266-4 in their first innings on Saturday. Azhar Ali was 74 not out as Pakistan attempted to move in on the 419 posted by Sri Lanka, which included a ninth test century from Dinesh Chandimal. Pakistan resumed the day on 64-0 and extended the opening partnership to 114 before offspinner Dilruwan Perera claimed Sami Aslam lbw for 51. Fellow opener Shan Masood went only two runs later for 59, bowled by left-arm spinner Rangana Herath. Azhar and Asad Shafiq (39) stabilized the innings with a 79-run partnership before Herath dismissed Shafiq. Azhar then shared a 71-run partnership with Babar Azam (28). Azam was caught behind off a delivery from Nuwan Pradeep to end play for the day. Herath finished with 2-47 off 25 overs. Pakistan were 121-2 at lunch and went through the afternoon session without conceding a wicket to go to tea at 194-2.